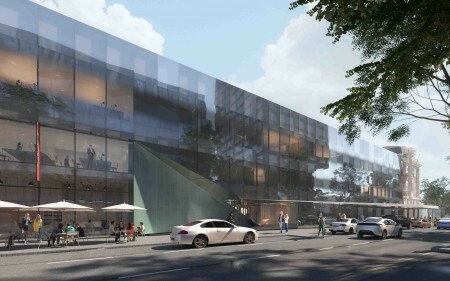 Preliminary design images of the new Christchurch Convention Centre showing how it will enhance the heart of the city have been released by Ōtākaro Limited. “We want to create an attractive facility for Christchurch, that draws people towards the Centre and its associated cafes and shops," says Ōtākaro Chief Executive Albert Brantley. The Christchurch Convention Centre will be capable of hosting up to 2000 delegates for a variety of national and international events. It will include a 1400 delegate auditorium, a 3600m2 exhibition hall and 1600m2 of meeting rooms that will overlook Victoria Square. The Armagh and Colombo street sides are straighter to reinforce the traditional edges of Victoria Square and Cathedral Square, and to tie in with the restored Lady Isaac building. The Colombo St side will be lined with hospitality and retail outlets and space has been created for the potential construction of a hotel that would further increase the level of activity around Cathedral Square. Armagh St will include areas for public use designed to encourage people to linger and enjoy the view of Victoria Square. Earthworks on the site are now well underway and the developed design process has commenced. A call for tenders from a shortlist of contractors has now been issued and Ōtākaro expects to appoint a main works contractor around July. A practical completion date of late 2019 is being targeted. 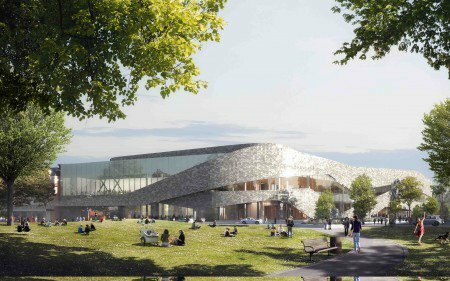 The Christchurch and Canterbury Convention Bureau (CCCB) has welcomed the design plans. CCCB Manager, Caroline Blanchfield says the striking design, set in a stunning central location, will give Christchurch a distinct edge. “The Christchurch Convention Centre is going to be the facility we always wanted, designed for both locals and visitors, attracting new and exciting public exhibitions, business meetings and gala functions to large multi-day conventions,” she says. “Its setting on the city’s waterfront overlooking Victoria Square and with links to Cathedral Square makes it distinctive and welcoming for everyone."